We booked our flights yesterday (BA & Interlink) so as luck would have it there's a Kulula sale on today! Hopefully some of our readers can take advantage. Flights must take place from 9 June 2009 to 31 August 2009, and may be booked on the 9th June 2009 from 6am until midnight, or until these seats sell out. (Ed: looking back from 2014, it would be delicious to be able to book these airfares. Of course none of them are available, and this page is solely for historical reference purposes). Kulula seats not available on all flights, and are subject to availability and change. You can book your flights at Kulula specials , and remember to use the flight price comparison engine to compare prices. 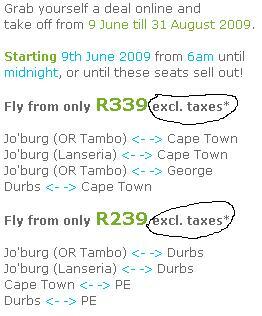 And for those of you who want to compare - here's our previous Kulula sale. Our last review of a Kulula/Comair flight was on the 28th Jan 2009.